Whereas there is, at this time, not without the shipwreck of many souls, and grievous detriment to the unity of the Church, a certain erroneous doctrine disseminated touching Justification; the sacred and holy, oecumenical and general Synod of Trent, lawfully assembled in the Holy Ghost,-the most reverend lords, Giammaria del Monte, bishop of Palaestrina, and Marcellus of the title of the Holy Cross in Jerusalem, priest, cardinals of the holy Roman Church, and legates apostolic a latere, presiding therein, in the name of our most holy father and lord in Christ, Paul III., by the providence of God, Pope,-purposes, unto the praise and glory of Almighty God, the tranquillising of the Church, and the salvation of souls, to expound to all the faithful of Christ the true and sound doctrine touching the said Justification; which (doctrine) the sun of justice, Christ Jesus, the author and finisher of our faith, taught, which the apostles transmitted, and which the Catholic Church, the Holy Ghost reminding her thereof, has always retained; most strictly forbidding that any henceforth presume to believe, preach, or teach, otherwise than as by this present decree is defined and declared. The Synod furthermore declares, that in adults, the beginning of the said Justification is to be derived from the prevenient grace of God, through Jesus Christ, that is to say, from His vocation, whereby, without any merits existing on their parts, they are called; that so they, who by sins were alienated from God, may be disposed through His quickening and assisting grace, to convert themselves to their own justification, by freely assenting to and co-operating with that said grace: in such sort that, while God touches the heart of man by the illumination of the Holy Ghost, neither is man himself utterly without doing anything while he receives that inspiration, forasmuch as he is also able to reject it; yet is he not able, by his own free will, without the grace of God, to move himself unto justice in His sight. Whence, when it is said in the sacred writings: Turn ye to me, and I will turn to you, we are admonished of our liberty; and when we answer; Convert us, O Lord, to thee, and we shall be converted, we confess that we are prevented by the grace of God. Now they (adults) are disposed unto the said justice, when, excited and assisted by divine grace, conceiving faith by hearing, they are freely moved towards God, believing those things to be true which God has revealed and promised,-and this especially, that God justifies the impious by His grace, through the redemption that is in Christ Jesus; and when, understanding themselves to be sinners, they, by turning themselves, from the fear of divine justice whereby they are profitably agitated, to consider the mercy of God, are raised unto hope, confiding that God will be propitious to them for Christ's sake; and they begin to love Him as the fountain of all justice; and are therefore moved against sins by a certain hatred and detestation, to wit, by that penitence which must be performed before baptism: lastly, when they purpose to receive baptism, to begin a new life, and to keep the commandments of God. Concerning this disposition it is written; He that cometh to God, must believe that he is, and is a rewarder to them that seek him; and, Be of good faith, son, thy sins are forgiven thee; and, The fear of the Lord driveth out sin; and, Do penance, and be baptized every one of you in the name of Jesus Christ, for the remission of your sins, and you shall receive the gift of the Holy Ghost; and, Going, therefore, teach ye all nations, baptizing them in the name of the Father, and of the Son, and of the Holy Ghost; finally, Prepare your hearts unto the Lord. Of this Justification the causes are these: the final cause indeed is the glory of God and of Jesus Christ, and life everlasting; while the efficient cause is a merciful God who washes and sanctifies gratuitously, signing, and anointing with the holy Spirit of promise, who is the pledge of our inheritance; but the meritorious cause is His most beloved only-begotten, our Lord Jesus Christ, who, when we were enemies, for the exceeding charity wherewith he loved us, merited Justification for us by His most holy Passion on the wood of the cross, and made satisfaction for us unto God the Father; the instrumental cause is the sacrament of baptism, which is the sacrament of faith, without which (faith) no man was ever justified; lastly, the alone formal cause is the justice of God, not that whereby He Himself is just, but that whereby He maketh us just, that, to wit, with which we being endowed by Him, are renewed in the spirit of our mind, and we are not only reputed, but are truly called, and are, just, receiving justice within us, each one according to his own measure, which the Holy Ghost distributes to every one as He wills, and according to each one's proper disposition and co-operation. For, although no one can be just, but he to whom the merits of the Passion of our Lord Jesus Christ are communicated, yet is this done in the said justification of the impious, when by the merit of that same most holy Passion, the charity of God is poured forth, by the Holy Spirit, in the hearts of those that are justified, and is inherent therein: whence, man, through Jesus Christ, in whom he is ingrafted, receives, in the said justification, together with the remission of sins, all these (gifts) infused at once, faith, hope, and charity. For faith, unless hope and charity be added thereto, neither unites man perfectly with Christ, nor makes him a living member of His body. For which reason it is most truly said, that Faith without works is dead and profitless; and, In Christ Jesus neither circumcision, availeth anything, nor uncircumcision, but faith which worketh by charity. 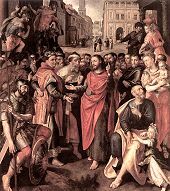 This faith, Catechumen's beg of the Church-agreeably to a tradition of the apostles-previously to the sacrament of Baptism; when they beg for the faith which bestows life everlasting, which, without hope and charity, faith cannot bestow: whence also do they immediately hear that word of Christ; If thou wilt enter into life, keep the commandments. Wherefore, when receiving true and Christian justice, they are bidden, immediately on being born again, to preserve it pure and spotless, as the first robe given them through Jesus Christ in lieu of that which Adam, by his disobedience, lost for himself and for us, that so they may bear it before the judgment-seat of our Lord Jesus Christ, and may have life everlasting. But, although it is necessary to believe that sins neither are remitted, nor ever were remitted save gratuitously by the mercy of God for Christ's sake; yet is it not to be said, that sins are forgiven, or have been forgiven, to any one who boasts of his confidence and certainty of the remission of his sins, and rests on that alone; seeing that it may exist, yea does in our day exist, amongst heretics and schismatics; and with great vehemence is this vain confidence, and one alien from all godliness, preached up in opposition to the Catholic Church. But neither is this to be asserted,-that they who are truly justified must needs, without any doubting whatever, settle within themselves that they are justified, and that no one is absolved from sins and justified, but he that believes for certain that he is absolved and justified; and that absolution and justification are effected by this faith alone: as though whoso has not this belief, doubts of the promises of God, and of the efficacy of the death and resurrection of Christ. For even as no pious person ought to doubt of the mercy of God, of the merit of Christ, and of the virtue and efficacy of the sacraments, even so each one, when he regards himself, and his own weakness and indisposition, may have fear and apprehension touching his own grace; seeing that no one can know with a certainty of faith, which cannot be subject to error, that he has obtained the grace of God. Having, therefore, been thus justified, and made the friends and domestics of God, advancing from virtue to virtue, they are renewed, as the Apostle says, day by day; that is, by mortifying the members of their own flesh, and by presenting them as instruments of justice unto sanctification, they, through the observance of the commandments of God and of the Church, faith co-operating with good works, increase in that justice which they have received through the grace of Christ, and are still further justified, as it is written; He that is just, let him be justified still; and again, Be not afraid to be justified even to death; and also, Do you see that by works a man is justified, and not by faith only. And this increase of justification holy Church begs, when she prays, "Give unto us, O Lord, increase of faith, hope, and charity." No one, moreover, so long as he is in this mortal life, ought so far to presume as regards the secret mystery of divine predestination, as to determine for certain that he is assuredly in the number of the predestinate; as if it were true, that he that is justified, either cannot sin any more, or, if he do sin, that he ought to promise himself an assured repentance; for except by special revelation, it cannot be known whom God hath chosen unto Himself. So also as regards the gift of perseverance, of which it is written, He that shall persevere to the end, he shall be saved:-which gift cannot be derived from any other but Him, who is able to establish him who standeth that he stand perseveringly, and to restore him who falleth:-let no one herein promise himself any thing as certain with an absolute certainty; though all ought to place and repose a most firm hope in God's help. For God, unless men be themselves wanting to His grace, as he has begun the good work, so will he perfect it, working (in them) to will and to accomplish. Nevertheless, let those who think themselves to stand, take heed lest they fall, and, with fear and trembling work out their salvation, in labours, in watchings, in almsdeeds, in prayers and oblations, in fastings and chastity: for, knowing that they are born again unto a hope of glory, but not as yet unto glory, they ought to fear for the combat which yet remains with the flesh, with the world, with the devil, wherein they cannot be victorious, unless they be with God's grace, obedient to the Apostle, who says; We are debtors, not to the flesh, to live according to the flesh; for if you live according to the flesh, you shall die; but if by the spirit you mortify the deeds of the flesh, you shall live. As regards those who, by sin, have fallen from the received grace of Justification, they may be again justified, when, God exciting them, through the sacrament of Penance they shall have attained to the recovery, by the merit of Christ, of the grace lost: for this manner of Justification is of the fallen the reparation: which the holy Fathers have aptly called a second plank after the shipwreck of grace lost. For, on behalf of those who fall into sins after baptism, Christ Jesus instituted the sacrament of Penance, when He said, Receive ye the Holy Ghost, whose sins you shall forgive, they are forgiven them, and whose sins you shall retain, they are retained. Whence it is to be taught, that the penitence of a Christian, after his fall, is very different from that at (his) baptism; and that therein are included not only a cessation from sins, and a detestation thereof, or, a contrite and humble heart, but also the sacramental confession of the said sins,-at least in desire, and to be made in its season,-and sacerdotal absolution; and likewise satisfaction by fasts, alms, prayers, and the other pious exercises of a spiritual life; not indeed for the eternal punishment,-which is, together with the guilt, remitted, either by the sacrament, or by the desire of the sacrament,-but for the temporal punishment, which, as the sacred writings teach, is not always wholly remitted, as is done in baptism, to those who, ungrateful to the grace of God which they have received, have grieved the Holy Spirit, and have not feared to violate the temple of God. Concerning which penitence it is written; Be mindful whence thou art fallen; do penance, and do the first works. And again; The sorrow that is according to God worketh penance steadfast unto salvation. And again; Do penance, and bring forth fruits worthy of penance. Before men, therefore, who have been justified in this manner,-whether they have preserved uninterruptedly the grace received, or whether they have recovered it when lost,-are to be set the words of the Apostle: Abound in every good work, knowing that your labour is not in vain in the Lord; for God is not unjust, that he should forget your work, and the love which you have shown in his name; and, do not lose your confidence, which hath a great reward. And, for this cause, life eternal is to be proposed to those working well unto the end, and hoping in God, both as a grace mercifully promised to the sons of God through Jesus Christ, and as a reward which is according to the promise of God Himself, to be faithfully rendered to their good works and merits. For this is that crown of justice which the Apostle declared was, after his fight and course, laid up for him, to be rendered to him by the just judge, and not only to him, but also to all that love his coming. For, whereas Jesus Christ Himself continually infuses his virtue into the said justified,-as the head into the members, and the vine into the branches,-and this virtue always precedes and accompanies and follows their good works, which without it could not in any wise be pleasing and meritorious before God,-we must believe that nothing further is wanting to the justified, to prevent their being accounted to have, by those very works which have been done in God, fully satisfied the divine law according to the state of this life, and to have truly merited eternal life, to be obtained also in its (due) time, if so be, however, that they depart in grace: seeing that Christ, our Saviour, saith: If any one shall drink of the water that I will give him, he shall not thirst for ever; but it shall become in him a fountain of water springing up unto life everlasting. Thus, neither is our own justice established as our own as from ourselves; nor is the justice of God ignored or repudiated: for that justice which is called ours, because that we are justified from its being inherent in us, that same is (the justice) of God, because that it is infused into us of God, through the merit of Christ. Neither is this to be omitted,-that although, in the sacred writings, so much is attributed to good works, that Christ promises, that even he that shall give a drink of cold water to one of his least ones, shall not lose his reward; and the Apostle testifies that, That which is at present momentary and light of our tribulation, worketh for us above measure exceedingly an eternal weight of glory; nevertheless God forbid that a Christian should either trust or glory in himself, and not in the Lord, whose bounty towards all men is so great, that He will have the things which are His own gifts be their merits. And forasmuch as in many things we all offend, each one ought to have before his eyes, as well the severity and judgment, as the mercy and goodness (of God); neither ought any one to judge himself, even though he be not conscious to himself of anything; because the whole life of man is to be examined and judged, not by the judgment of man, but of God, who will bring to light the hidden things of darkness, and will make manifest the counsels of the hearts, and then shall every man have praise from God, who, as it is written, will render to every man according to his works. After this Catholic doctrine on Justification, which whoso receiveth not faithfully and firmly cannot be justified, it hath seemed good to the holy Synod to subjoin these canons, that all may know not only what they ought to hold and follow, but also what to avoid and shun. CANON IV.-If any one saith, that man's free will moved and excited by God, by assenting to God exciting and calling, nowise co-operates towards disposing and preparing itself for obtaining the grace of Justification; that it cannot refuse its consent, if it would, but that, as something inanimate, it does nothing whatever and is merely passive; let him be anathema. CANON V.-If any one saith, that, since Adam's sin, the free will of man is lost and extinguished; or, that it is a thing with only a name, yea a name without a reality, a figment, in fine, introduced into the Church by Satan; let him be anathema. CANON VI.-If any one saith, that it is not in man's power to make his ways evil, but that the works that are evil God worketh as well as those that are good, not permissively only, but properly, and of Himself, in such wise that the treason of Judas is no less His own proper work than the vocation of Paul; let him be anathema. CANON VIII.-If any one saith, that the fear of hell,-whereby, by grieving for our sins, we flee unto the mercy of God, or refrain from sinning,-is a sin, or makes sinners worse; let him be anathema. CANON IX.-If any one saith, that by faith alone the impious is justified; in such wise as to mean, that nothing else is required to co-operate in order to the obtaining the grace of Justification, and that it is not in any way necessary, that he be prepared and disposed by the movement of his own will; let him be anathema. CANON XIX.-If any one saith, that nothing besides faith is commanded in the Gospel; that other things are indifferent, neither commanded nor prohibited, but free; or, that the ten commandments nowise appertain to Christians; let him be anathema. CANON XXVI.-If any one saith, that the just ought not, for their good works done in God, to expect and hope for an eternal recompense from God, through His mercy and the merit of Jesus Christ, if so be that they persevere to the end in well doing and in keeping the divine commandments; let him be anathema. CANON XXVIII.-If any one saith, that, grace being lost through sin, faith also is always lost with it; or, that the faith which remains, though it be not a lively faith, is not a true faith; or, that he, who has faith without charity, is not a Christian; let him be anathema. The same sacred and holy Synod,-the same legates of the Apostolic See presiding,-wishing to apply itself to restore ecclesiastical discipline, which is exceedingly relaxed, and to amend the depraved manners of the clergy and Christian people, has thought it fit to begin with those who preside over the greater churches; for the integrity of those who govern, is the safety of the governed. Trusting, therefore, that by the mercy of our Lord and God, and the provident vigilance of His own vicar on earth, it will surely for the future happen, that those who are most worthy,-and whose previous life, in every stage thereof, from their infancy to their riper years, having been laudably passed in the exercises of ecclesiastical discipline, bears testimony in their favour,-will be assumed unto the government of churches, in accordance with the venerable ordinances of the Fathers, for that it is a burthen whose weight would be formidable even unto angels: (the Synod) admonishes all those who, under whatsoever name and title, are set over any patriarchal, primatial, metropolitan, and cathedral churches, and hereby accounts all such admonished, that, taking heed to themselves, and to the whole flock, wherein the Holy Ghost hath placed them to rule the Church of God which he hath purchased with his own blood, they be vigilant, as the Apostle enjoins, that they labour in all things, and fulfil their ministry: but let them know, that fulfil it they cannot, if like hirelings they abandon the flocks committed to them, and apply not themselves to the keeping of their own sheep, whose blood will be required at their hands, by the Supreme Judge; seeing that it is most certain that, if the wolf have devoured the sheep, the shepherd's excuse will not be admitted, that he knew not thereof. And yet, for as much as some are to be found at this time, who-as is grievously to be lamented-forgetful even of their own salvation, and preferring earthly things to heavenly, and things human before divine, wander about in various courts, or, their fold forsaken, and the care of the sheep committed to them neglected, keep themselves occupied with the solicitudes of temporal affairs; it hath seemed good to the sacred and holy Synod to renew, as by virtue of the present decree It doth renew, the ancient canons promulgated against non-residents, which (canons) have, through the disorders of the times and of men, well nigh fallen into desuetude; and furthermore, in order to the more fixed residence of the same, and for the reforming of manners in the church, it hath seemed good to appoint and ordain in the manner following:-If any one, by whatsoever dignity, degree, and pre-eminence distinguished, shall, by remaining six months together out of his own diocese, all lawful impediment, or just and reasonable causes ceasing, be absent from a patriarchal, primatial, metropolitan, or cathedral church, under what title soever, cause, name, or right committed to him, he shall ipso jure incur the penalty of the forfeiture of a fourth part of one year's fruits, to be applied, by an ecclesiastical superior, to the fabric of the church and to the poor of the place. And if he continue absent in this way during six other months, he shall thereupon forfeit another fourth part of the fruits to be applied in like manner. But if the contumacy proceed yet further, the metropolitan shall, for the subjecting him to a severer censure of the sacred canons, be obliged to denounce his absent suffragan bishops, and the oldest resident suffragan bishop to denounce his absent metropolitan, to the Roman pontiff, either by letter or by messenger, within the space of three months, under the penalty, to be ipso facto incurred, of being interdicted from entering into the church; that he, by the authority of his own supreme See, may proceed against the said non-resident prelates, according as the greater or less contumacy of each may require, and provide the said churches with more useful pastors, as he shall know in the Lord to be salutary and expedient. Those inferior to bishops, who hold by title, or in commendam, any ecclesiastical benefices requiring personal residence whether by law or custom, shall be compelled, by their Ordinaries, to reside, by suitable legal remedies; as to them shall seem expedient for the good government of the churches and the advancement of the service of God, taking into account the character of the places and persons; and to no one shall any perpetual privileges, or indults, in favour of non-residence, or of receiving the fruits during absence, be of avail: temporary indulgences and dispensations, however, granted solely for true and reasonable causes, and which are to be legitimately proved before the Ordinary, shall remain in force; in which cases nevertheless, it shall be the office of bishops, as delegated in this matter by the Apostolic See, to provide that, by deputing competent vicars, and by assigning them a suitable portion of the fruits, the cure of souls be nowise neglected; no privilege or exemption whatever being of avail to any in this regard. Doth it please you, that the next ensuing Session be celebrated on Thursday, the fifth day after the first Sunday of the approaching Lent, which (Thursday) will be the third day of the month of March? They answered: It pleaseth us.